As a part of the Handmade Division Etsy Team we blog every month about the same topic. The first one was created for my true love when I was 20 years old (yes we are still together). I spent a long time designing a ring that would suit my boy's personality. He's not the type to wear any kind of jewellery and is generally introverted. So for me, being someone who loves creating items that are specifically meant to attract attention, it was very difficult to design a ring that expressed my love for him while suiting his quite reserved nature. 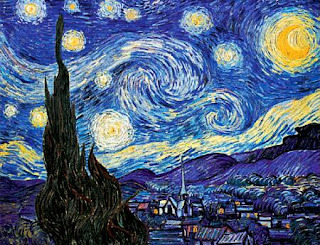 His favourite painting is Starry Night by Van Gogh. So I decided to carve the painting on the INSIDE of a ring, and leave the outside plain, creating a simple look for the world, while holding an interior space full of love and wonder. 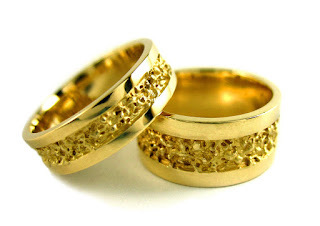 Around a similar time in my career when I was still in University my mother announced that she was getting remarried and she wished me to create her wedding rings. I was over joyed and learned about how we could melt down their old wedding rings and create new ones. I find this very facinating since you can literally melt down an old love to give birth to a new one. We designed these rings together and they are two of the most beautiful pieces I've ever made. 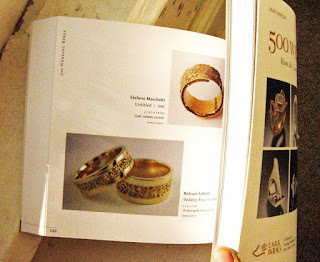 They are featured in Lark Book's 500 Wedding Rings. Wow. I love the stories behind these rings. They are incredibly beautiful. oh how wonderful! i love that you did that whole design on the INSIDE of that ring! fantastic! 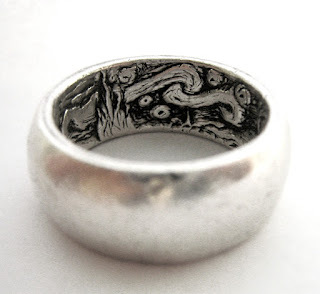 Love the ring with the carving inside! you should do more of those!! Wow. 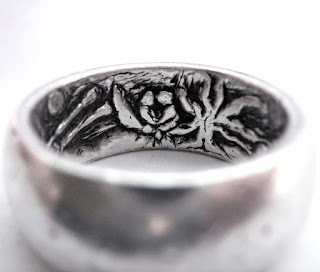 Not being a jeweler, it's amazing for me to think about how you carved such detail on the inside of the ring. Love that the inside design is a secret for the wearer. Great stories. Gorgeous rings.